Uwaa..... School love comedy is the best! Haw hah ha! 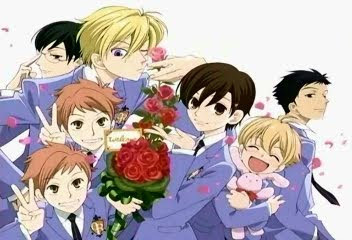 I happened to read manga ‘Ouran High School Host Club’ and hilarious laughs are the output. It’s unbelievably fresh, funny, crazy and enjoyable! (PERHATIAN: ini manga dan anime ngaco!) At first, I was not very impressed with the cover (of the manga) but I suddenly picked the first tankoubon and found that these manga is superb (haw ha ha). The mangas were created by Bisco Hatori and the tankoubon had reached four (or so I saw it last time at manga rental). The manga concern was at the host club daily events and activities. Fujioka Haruhi is a special student of Ouran High School because she is unexceptionally poor but outstanding student (she entered Ouran via scholarship), in the other way, all students of Ouran are kanemochi (rich or super rich men). Oh, well, because she did something unintentionally at the host club, she was apprehended to be one of the new members of host club. HWA ha haha!! HONTO wa KIRAI? SUKI? mousou na no? Is it hate? Or love? Or just paranoia? A lady, a host, that doesn’t matter to me. Let's accept each other's weaknesses, the love we have is invincible, we bloom and the two of us are the leading role. The present is much more important than the future, this lovely spring love is a blooming maiden's beauty! It's a blooming maiden's beauty!